13 years ago Lee recognized women were the top consumers of their jeans. And at the same time cause marketing was starting to take hold. Lee studied the causes that women really identified with and breast cancer was a clear winner. Lee wanted to do something because over 44,000 women a year die from breast cancer each year in the US. But they wanted to give the consumer the ability to make a difference. 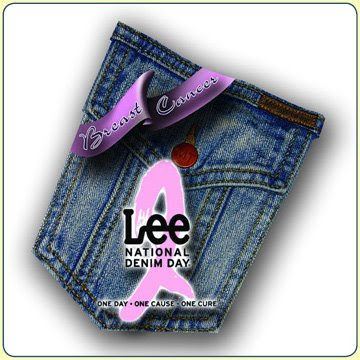 So they started the “pay $5 to wear jeans to work” on the first Friday of every October (aka – breast cancer awareness day) and wanted to create Lee national denim day. Over the last 13 years they raised $75M for breast cancer research. At the beginning of the program they were breaking ground – now it’s seems like a “sea of Pink” – So welcome to Web 2.0 it’s no longer about pushing information out – it’s about consumers generating conversations. They made sure it is searchable and found at the top of Google and Wikipedia page and it is updated all the time. That’s when the messaging really started to spread like widefire. They added celebrity ambassadors like Ellen DeGeneres and allow folks to connect with their ambassadors. They also used The Office TV show to create a Public Service Announcement (PSA) and got a 60% conversion rate because of that program off of YouTube. They harnessed blogs and message boards – “be very careful if you are trying to sell them – must be a very genuine conversation” Went to breast cancer blog sites – tried to give relevant information and how they can join in National Breast Cancer Awareness day. Billy Ray Cyrus – tapped into a whole group of country music fans. Over the last 13 years – the brand that cares for me – is one that you recommend to others! So companies should care about what their customers care about? Great post on cause marketing, thank you for putting it together, cheers! Miley really got her singing talent from Billy Ray Cyrus, no doubt about it.-‘.